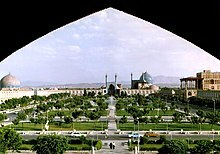 Persea land (Persisce: ايران, Iran – [irɒn]) is land on Asia, betƿeonum þǣre norþēasternan healfe þæs Persiscan Sǣƿes and Caspia. Manigfeald sind þisses lands folcas. Þæt hēafodgerīm on his landþēode sind Perse, and in Persealandes norðwest dæl būað Azere on þǣm Persican Azerbaicgane þās sprǣc is gesibb be Turcisc, and Curdas in Curdlande þā sprecað Curdisc. Ēac sind Luras in Persealandes westdǣle, Arabas in Khuzestane ðæm underrīce and sundriga folcas, ac eall sind be Persealand hold and getrīwe.